And so our review tonight continues with our “learning is fun” series from AR Entertainment as we travel across the world building puzzles to learn about animals, their habitats and the geography that surrounds them. With colorful graphics, Animated Puzzles turns your Apple device into a virtual wooden board as pieces are zipping around their environment while offering a 2 dimensional feel. Travel across the continents of North and South America, get a little chilly in the Arctic, dive deep into the Atlantic and Indian Ocean and explore what Africa, Australia, and Asia have to offer. Animated Puzzles is designed for all Apple devices running iOS 3.0 or later, however, for those implementing it with an iPad device, it works best with the latest operating system. 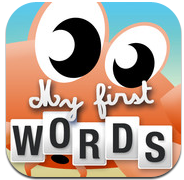 Like all other “learning is fun” app collections, Animated Puzzles is initially a free download offering young builders two animals, a penguin and a camel. To extend their animal adventures seven additional animals can be unlocked with an in-app purchase of $1.99. Animated Puzzles has a great deal of potential as it enhances visual and spatial skills and works on one’s hand-eye coordination. Upon entering this educational app, users will be presented with a map of the world as satellites hone in on particular parts of the world. Simply tap an unlocked animal and piece their environment back together. In a future update, we would love for users to hear the animals name when tapped prior to entering their environment. This would provide the target audience more exposure to new vocabulary. Environments will initially appear dull and boring, as it is your goal to drag and drop the colored images to their correct place. Each puzzle contains anywhere from 10-15 pieces. But be warned that parts of the wooden environment will move. By selecting one piece of the puzzle you will make all other pieces invisible, making it slightly easier to locate where that piece belongs. By locking all animals, plants and geography into place, users will make the environment come to life. As you navigate and learn about animals all over the world and ocean, users will find it very easy to navigate from one location to another. However, as we manipulated certain puzzles we found that the animation was rather fast and at times very busy. A note to the developers – might it be possible to incorporate a scroll bar feature at the bottom of each environment that would allow users to slow down or speed up those pieces that are animated. By adding this feature, children of all learning styles and needs can be successful without frustration. Whether you travel to one or all locations, puzzles can be repeated at any time. Animated Puzzles is designed for children ages 2-6 and as most parents know their little sponges are looking for any new knowledge that they can. 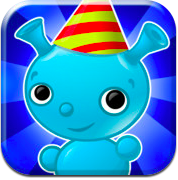 This educational app can be incorporated in a number of ways. For the early toddler population, it’s about having fun with animals as they build, manipulate and develop their fine motor skills. In doing so, they can most certainly be independent learners. As children near the preschool age, the question and need for information develops. With parent interaction and conversation, children could discuss animal names as they compare and contrast the different environments. For those nearing school age, they are capable of doing all of the above, however, I think they might like an added feature. In a future update, might it be possible as the environment comes to life that a WOW fact is presented and read aloud. It could be a feature that is turned on/off when necessary and with each return visit to an environment a new fact is learned. Overall, Applicable2U liked Animated Puzzles. To gain the fullest potential and possibilities of return visits around the world, users will want to have access to the full version. Yes, having seven additional animals to build and play with is great, however, Applicable2U believes it needs a little bit more. Possibly some of our suggestions will come in handy. As mentioned in our previous post, to learn more about AR Entertainment and Animated Puzzles, please visit their website here. 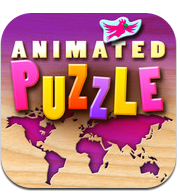 To set off on your animal travels of the world today, simply click here to add Animated Puzzles to your iTunes library.